I’ve been an interested follower of the debate around town centres since the Portas review of last year, not least because I live close by to a small town, and indeed it’s one where a debate is raging about the future and sustainability of the town centre as a place for people to visit, and to buy stuff. The town in question is Spalding, and right now there is quite a heated debate going on in the local press about two development ideas – one for a regeneration of an in-town-but-exactly-the-town-centre retail area, and the other proposing a big supermarket and retail park on the outskirts of town, but which might generate some section 106 money etc to help with other work. As you can see from this article on the local newspaper’s website, the topic is one that has inflamed local public opinion and it’s interesting to see people coming together to use an online platform to debate the issues. I can’t help but feel that the debate here is missing the point. I very much enjoy reading Julian Dobson’s blog, and his group’s submission to the Portas review, The 21st Century Agora (PDF warning) makes some very interesting points that really chime with me. High streets and town centres that are fit for the 21st century need to be multifunctional social centres, not simply competitors for stretched consumers. They must offer irresistible opportunities and experiences that do not exist elsewhere, are rooted in the interests and needs of local people, and will meet the demands of a rapidly changing world. In other words, the town centre shouldn’t be based just on buying stuff. We need other reasons for people to visit the town. 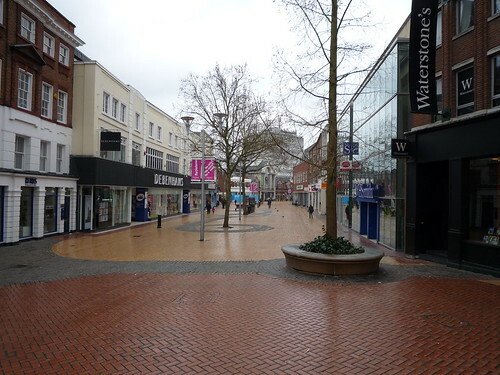 Town centres ought to be places where people meet, work, consume culture, share ideas, get things done – not just shop! Whither the internet in all this? It’s a view that the web, and the sheer efficiency of shopping online is one of the things that’s drawing the commercial elements away from the town centre. The Portas review did mention the use of the web to create an ongoing sense of community and conversation about a town centre. This has been picked up by Sarah Hartley from Talk About Local (she does wear other hats) in a number of posts, including a dead handy list of ways that online communities could help reverse the decline in high streets. If you’re interested in this stuff, Julian and co have started up an online community, using the Ning platform, and are organising an open space event to discuss the issues. Am hoping to be involved as much as I can. By practically supporting six communities across England, we hope to understand more about the role that technology can play in connecting and mobilising local communities to act, and to share good practice and lessons with other communities across the country. Deadline for applications (which I think have to be from community groups, not other organisations like councils) is 17 June. More details available in this PDF. Apologies for using the word ecosystems – I just couldn’t be bothered thinking of anything less naff. So earlier I blogged about the ways NESTA identified that government can help support local digital activity. I mentioned that there are many different elements of the digital scene within a specific locality, so thought it only fair if I have a crack at listing them. I suspect you could plot these things on a venn diagram, showing where they overlap. Wonder if there’s a sweet spot where they all overlap? Who are the actors and groups involved in this? The voluntary and community sector – the opportunities in digital for the civic sector are considerable. Great work by organisations like Cosmic and LASA demonstrate this, and even more could be done with an active digital community within a local area – whether through social media surgeries or more formal arrangements. So there’s a lot of activity, and a lot of different groups and people with an interest in that activity. It strikes me that there is a lot that can be done in an area to get all of this effort working better, more efficiently. Not through the creation of bureaucratic digital partnerships, but through simple, lightweight creative collaborations where different organisations work together to meet shared problems. Digital inclusion activity (improving access to, and skills for using, technology and networks) seems an obvious one. It’s better for government that people use online channels – it’s cheaper. At the same time, those people’s own lives could be improved with decent web access and skills. That can then lead onto the devlopment of the local digital economy, whether for training providers or people that build websites, or services computers, etc. What’s interesting here I think is the role that local authorities and other public sector organisations play in this. There are clear advantages for government if people are active online in the area, both in terms of service delivery, but also less directly, with successful digital economies developing areas and generating tax revenues. But what can they do? Most attempts by councils to provide environments for community websites, etc, tend to be a bit rubbish – though I know there are exceptions. I’ve got some ideas and – being the big tease that I am – I’ll share them in my next post on this topic. I’m increasingly interested in how creative collaborations between small suppliers, public services and organisations from other sectors can come together to solve problems in an open innovation-y sort of way. The digital arena is probably one of the best places for this type of thing to happen, and a useful post has appeared on one of NESTA’s blogs about it. Encourage the take-up of broadband and internet access more widely so that we can all participate in this world. Let’s not leave anyone behind. Find new business models to balance freely available broadband in cities with ISP’s right to recoup the costs of putting in a next generation infrastructure. Open up local data at a very local level, and then find ways of encouraging engagement between the private creative businesses and our public sector. Our Make it Local programme is trying to do this, but we need much more of it. Remember that most digital developers still need to make real-world connections to get business and the role of local and regional agencies – both trade associations and screen agencies can be tremendously valuable in helping digital SMEs to win business. There’s another post to be written at some point about the different aspects of digital activity in an area, and what the role is of government in supporting and nurturing that. But it’s certainly more than just subscribing to local bloggers – important though listening is. I’m going to be writing a few posts about this in the future, I think, so have created a category – ‘digital local‘ – for them to sit in.